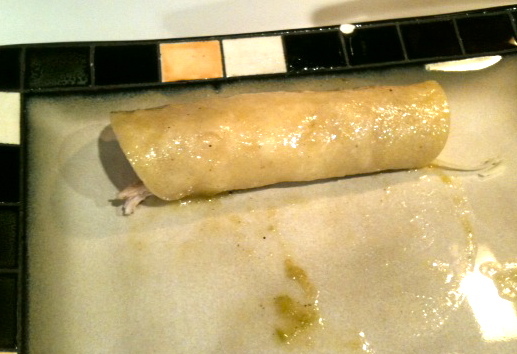 Or chicken enchiladas with green sauce…. 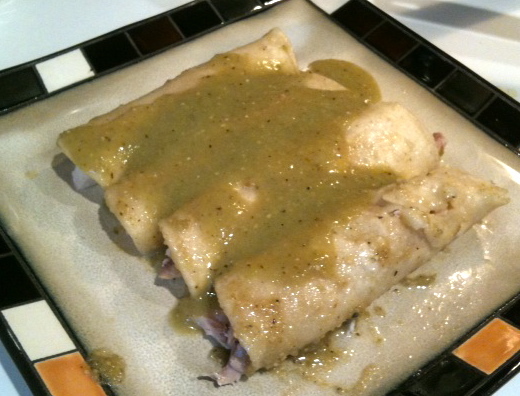 I love chicken enchiladas, with my mother in-laws green sauce, AWESOME!!! Chicken, I use the rotisserie chickens already cooked at Costco, or the grocery store. ~Take husks off tomatillos and place in a large pan covered with water, add onion, garlic, bullion, and chilies (steams cut off, and scrape of seeds if you don’t want the sauce too hot), bring to a rolling boil. Let reduce for 20-40 minutes (sometimes I leave it longer, as you can add more water if you need it). ~Once nice and hot, pour into blender and VERY CAREFULLY blend, remember most blenders done like hot liquids, so use caution. 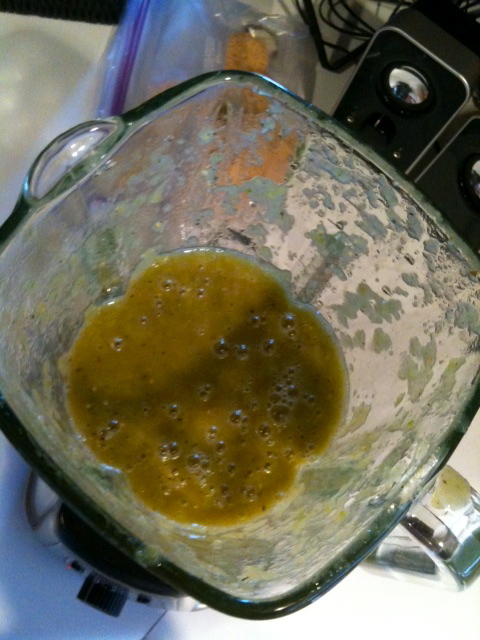 ~Check for thickness of sauce, if it fairly thick, and a bit of water at a time, blending between each addition. 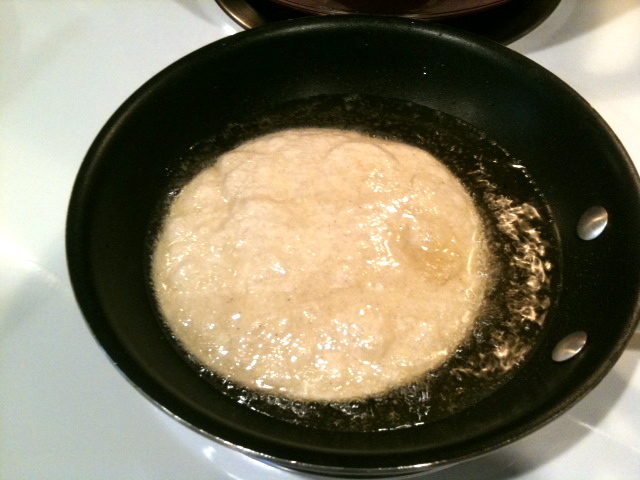 ~Once you get to the desired consistency, place a 1/2 cup of sauce in pan, place on low heat. ~With a smaller (omelet sized) pan pour a small about of oil, and heat, you wont even need enough to completely submerge the tortilla. ~Fry tortilla, you don’t want it crispy (like a tostada), but you don’t want it soft (because it will rip), make it an “in betweener”. 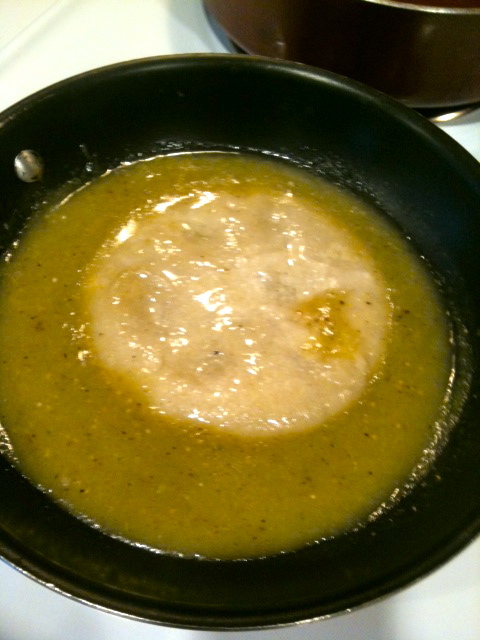 ~Transfer to pan with sauce, submerge. ~When you have all the enchiladas you want, pour more sauce on top, add more cheese, and I place in the oven with the boiler on just to melt the cheese. Sour cream, avocado and pico de gallo are all great on these, but use what you like, either way enjoy. And if you have picky kiddos, fill ’em with cheese, and they’ll love them!! My mother-in-law has placed hard-boiled egg on top occasionally, and I will admit, I was a bit weirded out by that, but I didn’t want to be rude so I ate it with the enchiladas, and now I LOVE it….weird I know, but so good!!! Either way, I hope you enjoy…. 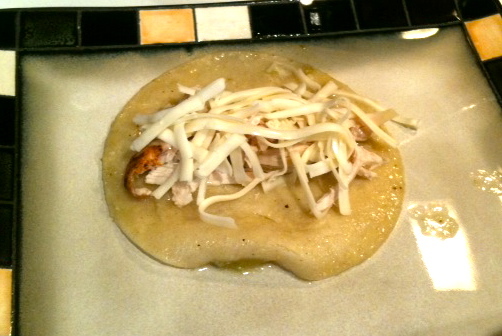 Categories: Cheese, Chicken, Mexican Food, Sauce / Salsa | Tags: chicken, mexican, sauce, tortilla | Permalink.